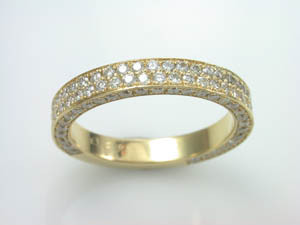 Ladies 18ct Yellow Gold Diamond Ring. Gold Bangles & Bracelets Ladies 9ct Yellow and White Gold Hinged Bangle. Ladies 9ct Yellow and White Gold Hinged Bangle. Ladies 9ct Yellow and White Gold Hinged Bangle.| Rounded Crossover Design. G5920.